I have photographed hundreds of people, and many times before we start they tell me, “I hate my picture. I never take a good picture.” I feel as popular as a dentist, and I’m not going to stick anything into their mouth. Why is this? I have a couple of theories. Let’s not overlook the obvious — it could be the photographer’s fault. He or she may have chosen the wrong angle, the wrong lighting or failed to engage their subject. But even perfect shots will leave some subjects cold. Why? Most faces are asymmetrical, as demonstrated by this passport photo of my daughter. What she sees in the mirror is the image on the right. What the world sees is the image at left. And that’s what the camera records. Just like hearing our recorded voice played back is disconcerting (because we hear much of our voice via bone conduction), seeing our face reversed can be vaguely unsettling. Something seems off, but we can’t put our finger on it. Faces are not objects, really. They are living things that communicate with other living things. When you speak to another person, your attention is primarily on their eyes and mouth. In the photos above I notice moles on her cheek. I never see them when I’m with her. I pay attention to this because every photo gets touched up. My rule of thumb for touching up faces is to always remove temporary blemishes — they are not part of the face. Bumps, warts, moles I leave but diminish — not to produce something phony, but the opposite. I want the portrait to register the same way the face would in person. If two people look at an object, say a rose, they will more or less see the same thing. But this is not true for faces. People will disagree about who the grandchild resembles — they’re all looking at the same child and all seeing something different. Or consider how you can sometimes recognize an adult from their baby picture. How can that be? So much is physically different, and yet, something essential is similar. 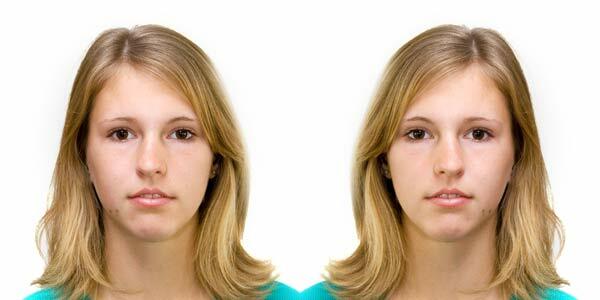 Why we each read faces differently is a mystery. So I know that when I review portraits with a subject, while we may be looking at the same image, we mostly likely are not seeing the same image. Unless the person is asleep, we normally sees faces in motion. The motion is subtle, but it’s there. I see this every time I review a series of images from a photo shoot — minute differences appear from one frame to another. For those of you who think you never look great in photos, there is bad news and good news. The bad news is that you’re probably right. You don’t look great in photos. The good news is that you probably look much better in real life – when you are your normal animated self. Research conducted at UC Davis and Harvard suggests that there is something about a static image of a face that reduces attractiveness relative to a short video clip of the same face. Researchers term the relative unattractiveness of static faces the “frozen face effect.” To demonstrate the effect, volunteers were asked to view a set of 20 short video clips of various faces. They were also shown a series of static images which were pulled from the video clips. When asked to rank all the imagery for attractiveness, faces shown in their video forms were consistently rated higher than the same face viewed as static images. Research also shows that there are cultural differences in how people smile.